With the popularity of data hogging smartphones, tablets and televisions, there has been a surge in the demand for portable Wi-Fi routers. The Huawei Wi-fi E5331 is a compact router meant to work with your data SIM. This white pebble-shaped lightweight router is small enough to go in your pocket. It has a OLED display as well as four LED icons for network, Wif-Fi, battery and message. A green glow means a strong signal and full battery, whereas red is indicated no signal and low battery. Configuring the router was easy and we just had to insert the SIM card in the slot below the battery. When we turned on the router, we were able to detect the network and connect to the router. You will need to read the manual though. Wi-Fi E5331 comes with a 1500 mAh rechargeable battery that gave us close to four hours of work on a single charge. 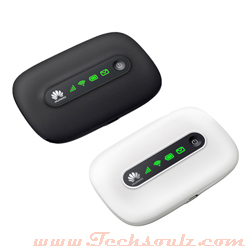 The Huawei E5331 can connect up to five devices and offer a maximum of 21mbps. Our Reliance SIM gave us a download speed of 3.16 MB and upload speed of 1.60 MB.